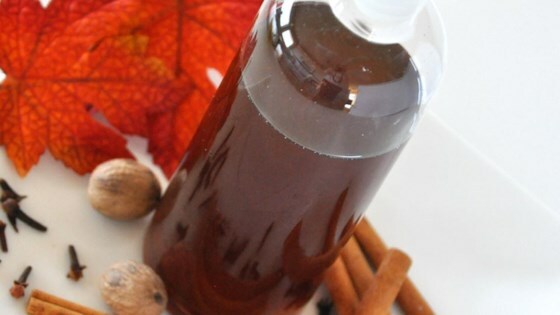 "This is a delightful spicy syrup that you can use to spice up coffee, tea, apple cider, you name it, it's all good! Add a tablespoon to your favorite beverage, or use it in whipped cream, or brush it on cakes. Drizzle it on yogurt, oatmeal, or pancakes - the possibilities are endless!" In a saucepan over medium-high heat, combine water, sugar, and honey. Stir in ginger, cinnamon stick, cloves, allspice, peppercorns, and nutmeg; bring to a boil. Reduce heat, cover, and simmer for 25 to 30 minutes. Let cool for 20 minutes, then strain through a fine mesh sieve, or double layer cheesecloth. For Chai flavors, you can add 6 green cardamom pods and 2 stars of star anise. Absolutely delicious. I tried it in coffee and tea. I will make this again and again! Thanks for the recipe.